This section provides an overview of how existing resources are qualified for a Forward Capacity Auction (FCA). Details can be found by taking the online course “Existing Capacity Qualification Process for Generation, Imports, and DCRs,” or downloading the PDF transcript. Both are available on the Training Materials webpage. Except for resources registered with the ISO before February 2007, the capacity of each resource must be at least 100 kilowatts (kW) to participate in a Forward Capacity Auction. The ISO will calculate the appropriate qualified capacity values for existing resources and notify participants via the Existing Capacity Qualification Market Information Server (MIS) report. Once these values are posted, the ISO opens the challenge window. The existing qualified capacity value for demand capacity resources is calculated as detailed in Market Rule 1, Section III.13.1.4.1.1, Existing Demand Capacity Resources. In short, existing qualified capacity values equal the sum of existing qualified capacity values from the prior capacity commitment period and new qualified capacity that cleared in the prior Forward Capacity Auction, minus accepted retirement and permanent delist bids, terminations, and expiring energy-efficiency measures. Before the initial MIS report, the summer and winter qualified capacity will be reduced by the megawatt contribution of those energy-efficiency measures that will have reached the end of their measure life before the relevant capacity commitment period start date. After the ISO issues initial MIS reports, existing qualified capacity values will be viewable in the Forward Capacity Tracking System (FCTS). Issuance dates for initial MIS reports vary by Forward Capacity Auction. You can find the specific date in the appropriate auction calendar. (Learn how to access the auction calendars.) An email notice will be sent out to prompt participants to review their resource information. To receive these emails, as well as all other FCM notices, subscribe to the Capacity (ICAP and FCM) Announcements mailing list (hit send when the subscription email opens up). Select the resource on the Existing Capacity Summary Link search screen. On the Resource Information page, select the Summary tab to see the Existing Qualified Capacity Values. Any changes to a resource’s qualified capacity will be reflected in the initial MIS report. The report will also flag any significant decreases in capacity, if applicable. 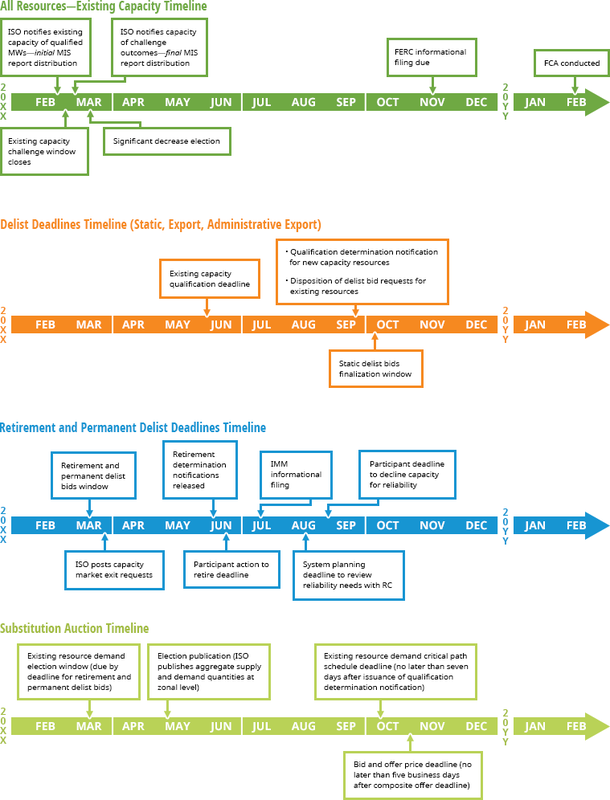 Resources that have been flagged with a significant decrease can submit a critical path schedule describing the measures that will be taken to restore the summer qualified capacity. If a critical path schedule is not submitted, the summer qualified capacity will be derated to the most recent summer seasonal-claimed-capability value. For more details, see the online course “Existing Capacity Qualification Process for Generation, Imports, and DCRs,” or download the PDF transcript. Both are available on the Training Materials webpage. Within a window of five business days, participants may request, via the FCTS, a change to either or both a resource’s summer or winter existing qualified capacity values if they believe the calculation of qualified capacity megawatts contained an error. This window is only to address the qualified capacity calculation. To increase a resource’s capacity, a show of interest must be submitted. To reduce the qualified capacity, a delist bid must be submitted. For details on challenge options, see the “Existing Capacity Qualification Process for Generation, Imports, and DCRs” training (see More Information below). All challenges are subject to the ISO’s review. System Planning uses the M&V plan to evaluate whether claimed energy reductions from projects are additional and verifiable. M&V plans must be submitted for all new demand capacity resources, and participants have the option of updating their plans once resources reach commercial operation. M&V updates are required if a resource changes its demand capacity resource type or methodological approach to M&V. Five business days after the challenge window closes, the ISO releases a second MIS report to the FTP sites with the final qualified megawatt amounts, which will also be viewable in the Forward Capacity Tracking System (FCTS). Take the online course “Existing Capacity Qualification Process for Generation, Imports, and DCRs” or download the PDF transcript. Both are available on the Training Materials webpage. See Market Rule 1, Section III.13.1, Forward Capacity Auction Qualification, for details on FCM qualification of existing capacity. The ISO New England Manual for the Forward Capacity Market (M-20) provides FCM participants with additional information and details regarding steps and actions they must take. View ICAP/FCM Market Notices in the ISO calendar. After clicking on an announcement or event, you can subscribe to email alerts for related materials. If the ISO accepts the delist bids, as discussed below, the capacity will be removed for a single capacity commitment period (CCP) only—the megawatts associated with the delist bid are treated as existing capacity in the next CCP. Resources that wish to permanently retire some or all capacity should see the section on submitting a permanent delist bid or retirement delist bid. Except in the case of a retirement delist bid, all delisted megawatts are allowed to continue participation in the energy and ancillary markets. Static delist bid (general): provides the ability to remove capacity from the capacity market at prices at or above the dynamic delist bid threshold for a single capacity commitment period (cost justification required). The lead market participant must submit a completed cost workbook and an affidavit executed by a corporate officer attesting to the accuracy of the delist package. The lead market participant must indicate whether a resource will be participating in the energy and ancillary service markets. *The dynamic delist bid threshold is recalculated at least every three years and can be found in Market Rule 1, Section III.13.1.2.3.1.A, Dynamic Delist Bid Threshold. Use the appropriate online system noted below to submit the desired type of delist bid. See the “FCM 101: Delisting” training available on the Training Materials webpage for detailed instructions. Email custserv@iso-ne.com to request the inframarginal rent (IMR) and the inflation index as published by the Federal Reserve Bank of Cleveland. These are inputs into the resource’s net going-forward costs. The net going-forward costs are the costs incremental to obtaining a capacity supply obligation and are therefore avoidable if the resource does not have a capacity supply obligation. Unavoidable costs are not to be included in the calculation of the net going-forward costs. Any adjustments to components of the bid, such as revenues, fuel, and emissions, to reflect typical power-year operations must include a description of the components being adjusted and the adjustment methodology. In your documentation, include data on the expected number and duration of capacity scarcity conditions, as well as the unit’s expected average capacity balancing ratio and expected average performance during those capacity scarcity conditions. You must include details of the risk-premium analysis calculation; an affidavit executed by a corporate officer attesting to the accuracy of the risk-premium calculation is optional. Submitting dynamic delist bids occurs in the FCA auction system via the auction bid/offer functions. Each bidder receives an FCA user guide before the auction, which provides instructions on how to submit dynamic delist bids. Submissions occur during the Forward Capacity Auction when prices are within the allowable range, as described in Market Rule 1, Section III.13.1.2.3.1.A, Dynamic Delist Bid Threshold. Other types of delist bids are submitted using the Forward Capacity Tracking System (FCTS). See the Existing Qualification tab of the CCP in which the resource is delisting. Initial submissions are due by the existing capacity qualification deadline. Participants may modify static delist bids during the static delist bid finalization window beginning no later than seven days after the ISO’s issuance of the qualification determination notification (QDN). Changes to a resource’s rationing minimum limit must also be submitted via an Ask ISO case before the close of the static delist bid finalization window. Static delists bids approved by the Internal Market Monitor (IMM) at prices greater than the FCA starting price are entered into the FCA at the FCA starting price. A resource with a static delist bid cannot receive a CSO at the FCA starting price unless it has been retained for reliability. Static delist bids at the FCA starting price retained for reliability will be subject to compensation under Market Rule 1, Section III.13.2.5.2.5.1, Compensation for Bids Rejected for Reliability Reasons. If a delist bid is rejected for reliability reasons, the resource will be paid a “just and reasonable” rate as determined by FERC. If the Internal Market Monitor (IMM) rejects a delist bid for economic reasons during its review, resources deemed pivitol will not be allowed to delist in the FCA at the submitted price. Delist bids may be subject to review by the IMM, and all delist bids are subject to a reliability review. Details can be found in the Planning Procedure to Support the Forward Capacity Market (PP-10), Section 7. Dynamic delist bids will undergo their reliability review between rounds of the FCA. Dynamic delist bids will be accepted or rejected for reliability before the auction resumes. Forward Capacity Market (FCM) participants can exit the FCM permanently by using retirement delist bids or permanent delist bids. You cannot use a permanent or retirement delist bid in combination with single capacity commitment period (CCP) delist bids. Single CCP delist bids allow you to remove a resource from the FCM only at a certain price or for a specific capacity commitment period. Learn about using single CCP delist bids. Existing resources that don’t submit any type of delist bid during the appropriate window will be entered in the Forward Capacity Auction. Permanent delist bids provide the option to permanently remove capacity from the capacity market at the start of the capacity commitment period. Retirement delist bids are irrevocable requests to permanently remove capacity from all ISO markets at the start of the capacity commitment period. Regarding participation in a substitution auction: Beginning with the February 2019 annual (FCA, existing generating capacity resources or existing import capacity resources associated with external elective transmission upgrades may also participate in a substitution auction to retire. Resources submitting retirement delist bids are required to participate. Be aware that some of the deadlines for the substitution auction overlap with those for the primary auction. See FCM Substitution Auction Overview and Timeline and Demand Participation in the FCM Substitution Auction for details. The IMM will calculate a test price for all retiring resources to determine whether the resource’s demand bid can enter the substitution auction. See Demand Participation in the FCM Substitution Auction for details. When a partial retirement delist bid clears in the FCA, the resource remains active and its interconnection rights are reduced to the appropriate megawatt level. When a partial permanent delist bid clears in the FCA, the qualified capacity value for the resource is reduced. Upon clearing a full retirement delist bid, the resource and asset will be retired from all ISO markets and the interconnection rights for the resource will be completely removed. Upon clearing a full permanent delist bid, the resource will be removed from the capacity market starting with the capacity commitment period for which the delist bid was accepted. Use the Forward Capacity Tracking System (FCTS) to submit a permanent or retirement delist bid. See the Existing Qualification tab for the CCP in which the resource is delisting. See the “FCM 101: Delisting” training available on the Training Materials webpage for detailed instructions. For permanent delist bids, the lead market participant must indicate whether a resource will be participating in the energy and ancillary service markets. The Internal Market Monitor will review these requests and release a retirement determination notification (RDN) at least five business days before the existing capacity qualification deadline. Participants will be notified whether their resource is needed for fuel-security reliability five business days before the existing capacity qualification deadline. Once the RDNs are released, the lead market participants for these resources have five business days to elect either retirement or conditional treatment (the resource will retire unless the FCA clears above the submitted price). If no election is made, the default is to accept the price in the retirement determination notification. The ISO will make an informational filing with the Federal Energy Regulatory Commission no later than 20 days after the issuance of the RDNs. After the IMM informational filing, the ISO will discuss the reliability review with the NEPOOL Reliability Committee in August. Shortly after, the reliability determination notifications will be released. Prior to the auction, the ISO will review in descending price order all Permanent and Retirement De-List Bids at or above the FCA Starting Price and Permanent and Retirement De-List Bids for which the Participant has opted for the ISO to perform a transmission security reliability review. Participants will be notified whether their resource is needed for transmission security reliability following the ISO’s consultation with the Reliability Committee in August. The lead market participant can decline to provide the associated capacity for reliability no later than the fifth business day in September after the Reliability Committee meeting. If the resource requesting to retire does not clear a retirement delist bid and instead obtains a capacity supply obligation, the resource’s retirement delist bid will be automatically carried forward to the next Forward Capacity Auction. The lead market participant can adjust the retirement delist bid price, if desired, by submitting an updated cost workbook by the existing capacity retirement deadline. A composite offer allows capacity resources that have each received a qualified capacity value to participate together to maximize their combined offer in a Forward Capacity Auction. Composite offers can be submitted during the composite offer window for the desired FCA. (Learn how to access the auction calendars.) Composite offers can be modified or withdrawn in the Forward Capacity Tracking System (FCTS) until the composite-offer deadline. The ISO Seasonal Resource Capacity eBulletin Board provides a place where project sponsors of single-season capability resources can find a partner to participate in an FCA through a composite offer. An individual resource may also self-composite when that resource has an existing component and a new component. A new capacity resource with greater summer than winter capacity that chooses to have a multiyear capacity supply obligation cannot participate in a composite offer. Summer resources in import-constrained capacity zones may only pair with winter resources located in the same capacity zones. Summer resources in export-constrained capacity zones may pair with any winter resource in the same export-constrained zone. Summer resources in the Rest-of-Pool zone may pair with any resource not located in an export-constrained zone. When entering into composite offers, demand capacity resources must enter in the qualified capacity amounts (amount grossed up for losses), not the demand-reduction value. The FCTS will not automatically alert your composite-offer partner that they must take action. You must do this. If submitting a self-composite, you must close the FCTS completely between steps. Initiate the composite offer in the FCTS. The Composite Offer Status will display as “Pending.” Ask your winter partner to act. Designate the winter resource to the composite offer. Status remains “Pending.” Ask your summer partner to act. Submit the composite offer. Status displays “Confirmed.” Ask your winter partner to act. Verify submission: both participating resources should appear under Winter Resource Information (MW). If they don’t, contact Customer Support. Only the summer resource partner in a composite offer should bid in an FCA. Both resources do not need to bid in individually. Each resource will be paid individually. The PER adjustment applies to the resource providing the supply obligation in that month. Note that the peak-energy-rent mechanism is being eliminated. The capacity market payment adjustments associated with the PER mechanism will continue in place until June 1, 2019. After that date, the PER mechanism will no longer apply. See Market Rule 1, Section III.13.1.5, Offers Composed of Separate Resources. Take the online course “Forward Capacity Market: Composite Offers” available on the Training Materials webpage.